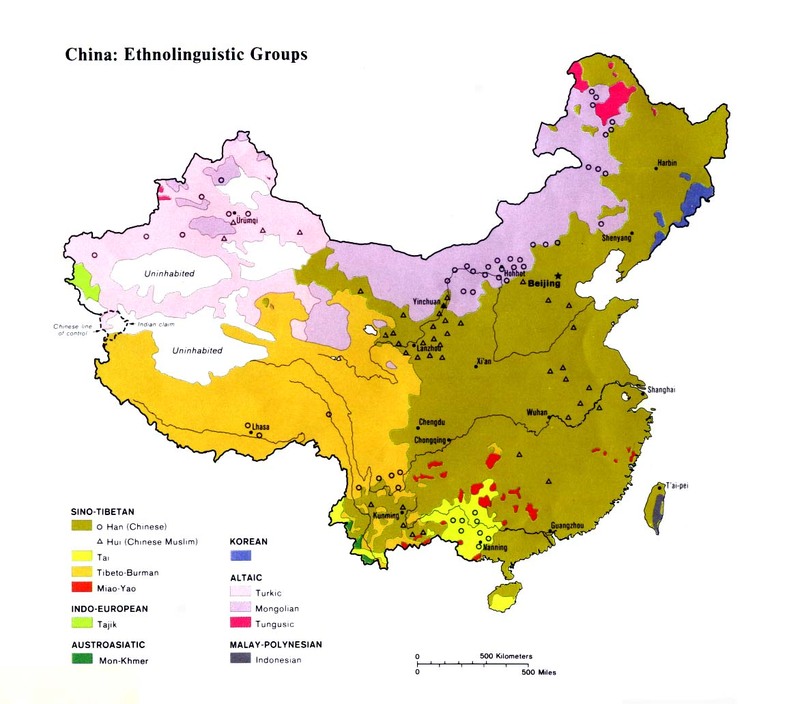 The Han Chinese are one of the 56 official nationalities of China. The name China stems from the Qin (Chin) Dynasty of 221-207 BC. The Chinese call their country Zhongguo, "The Middle Kingdom." The Wei Dynasty (AD 220-280): After the collapse of the Han Dynasty, China fell into almost 400 years of crippling war and internal conflict. The country was divided into three kingdoms. The Wei ruled areas north of the Yangtze. The Chinese have invented numerous items throughout their long history, including paper and gunpowder. The Chinese have been most influenced by Buddhism, Daoism, and Confucianism throughout their history, but since the advent of Communism in 1949 most Chinese could be accurately described as nonreligious. Christianity first made an impact on China in AD 635, when Nestorian Bishop Alopen arrived in China. "Bishop Alopen of the Kingdom of Ta'chin, bringing with him the sutras and images, has come from afar and presented them at our Capital. Having carefully examined the scope of his teaching, we find it to be mysteriously spiritual, and of silent operation. Having observed its principal and most essential points, we reached the conclusion that they cover all that is most important in life. This Teaching is helpful to all creatures and beneficial to all men. So let it have free course throughout the Empire." By 638 the first church was built in Chang'an, and 21 Persian monks had commenced work in China. By the time missionaries were expelled from China in the 1950s, it is generally agreed there were no more than 750,000 Chinese Protestants across the nation. Since that time, China has experienced one of the greatest revivals in church history, with some eastern provinces experiencing continual growth for more than 30 years. Despite these great developments, hundreds of millions of Han Chinese today have yet to hear the name of Christ. A very wide range of estimates exist for the number of Christians in China today, from a lowest figure of 13.7 million, to widely used but unsupported figures of 90 to 110 million. We believe there are between 40 and 50 million Mandarin speaking Chinese believers in China today. Scripture Prayers for the Han Chinese, Mandarin in China.